Tensile testing on a coir composite. Specimen size is not to standard (Instron). Predict how a material will perform in use: normal and extreme forces. Tensile specimens made from an aluminum alloy. The left two specimens have a round cross-section and threaded shoulders. The right two are flat specimens designed to be used with serrated grips. The preparation of test specimens depends on the purposes of testing and on the governing test method or specification. A tensile specimens is usually a standardized sample cross-section. It has two shoulders and a gage (section) in between. The shoulders are large so they can be readily gripped, whereas the gauge section has a smaller cross-section so that the deformation and failure can occur in this area. The shoulders of the test specimen can be manufactured in various ways to mate to various grips in the testing machine (see the image below). Each system has advantages and disadvantages; for example, shoulders designed for serrated grips are easy and cheap to manufacture, but the alignment of the specimen is dependent on the skill of the technician. On the other hand, a pinned grip assures good alignment. Threaded shoulders and grips also assure good alignment, but the technician must know to thread each shoulder into the grip at least one diameter's length, otherwise the threads can strip before the specimen fractures. In large castings and forgings it is common to add extra material, which is designed to be removed from the casting so that test specimens can be made from it. These specimens may not be exact representation of the whole workpiece because the grain structure may be different throughout. In smaller workpieces or when critical parts of the casting must be tested, a workpiece may be sacrificed to make the test specimens. For workpieces that are machined from bar stock, the test specimen can be made from the same piece as the bar stock. The repeatability of a testing machine can be found by using special test specimens meticulously made to be as similar as possible. The following tables gives examples of test specimen dimensions and tolerances per standard ASTM E8. Tensile testing is most often carried out at a material testing laboratory. The ASTM D638 is among the most common tensile testing protocols. The ASTM D638 measures plastics tensile properties including ultimate tensile strength, yield strength, elongation and Poisson’s ratio. The most common testing machine used in tensile testing is the universal testing machine. This type of machine has two crossheads; one is adjusted for the length of the specimen and the other is driven to apply tension to the test specimen. There are two types: hydraulic powered and electromagnetically powered machines. The machine must have the proper capabilities for the test specimen being tested. There are four main parameters: force capacity, speed, precision and accuracy. Force capacity refers to the fact that the machine must be able to generate enough force to fracture the specimen. The machine must be able to apply the force quickly or slowly enough to properly mimic the actual application. Finally, the machine must be able to accurately and precisely measure the gauge length and forces applied; for instance, a large machine that is designed to measure long elongations may not work with a brittle material that experiences short elongations prior to fracturing. 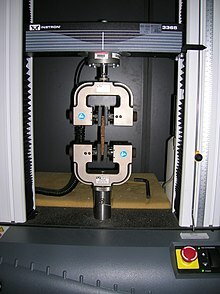 Alignment of the test specimen in the testing machine is critical, because if the specimen is misaligned, either at an angle or offset to one side, the machine will exert a bending force on the specimen. This is especially bad for brittle materials, because it will dramatically skew the results. This situation can be minimized by using spherical seats or U-joints between the grips and the test machine. If the initial portion of the stress–strain curve is curved and not linear, it indicates the specimen is misaligned in the testing machine. The strain measurements are most commonly measured with an extensometer, but strain gauges are also frequently used on small test specimen or when Poisson's ratio is being measured. Newer test machines have digital time, force, and elongation measurement systems consisting of electronic sensors connected to a data collection device (often a computer) and software to manipulate and output the data. However, analog machines continue to meet and exceed ASTM, NIST, and ASM metal tensile testing accuracy requirements, continuing to be used today. where F is the tensile force and A is the nominal cross-section of the specimen. The machine does these calculations as the force increases, so that the data points can be graphed into a stress–strain curve. ASTM D 3039/D 3039M: "Standard Test Method for Tensile Properties of Polymer Matrix Composite Materials"
^ Czichos, Horst (2006). Springer Handbook of Materials Measurement Methods. Berlin: Springer. pp. 303–304. ISBN 978-3-540-20785-6. ^ a b Davis, Joseph R. (2004). Tensile testing (2nd ed.). ASM International. ISBN 978-0-87170-806-9. ^ Davis 2004, p. 33. ^ a b c d e Davis 2004, p. 2. ^ a b c d Davis 2004, p. 9. ^ a b Davis 2004, p. 8. ^ a b Davis 2004, p. 52. ^ Davis 2004, p. 11.